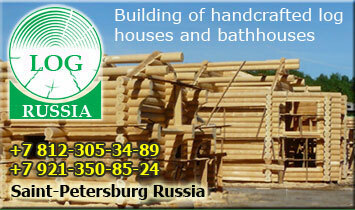 Experts of the company "Log Russia" possess experience of building of wooden houses with use of almost all technologies existing today. 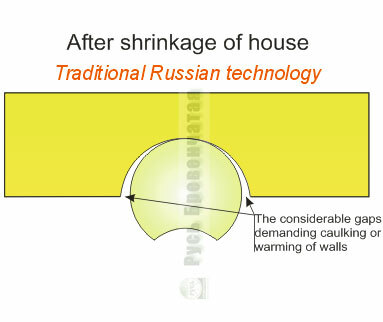 In our company You can order a house with the traditional Canadian notch, an advanced Canadian notch (with a dowel), houses or baths of the Norwegian technology (the Norwegian notch for a semi-oval log), well and certainly a cottage on traditional Russian technology (in a simple round cup). But, as hospitable owners, we necessarily should tell to you about advantages and lacks of this or that method as you could choose a way of building of your house or a bath, possessing all volume of the necessary information. 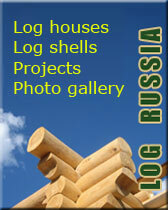 In this section we will compare building in Russian and Canadian "bowls" for a round log. The basic difference of the Canadian cup is a presence of a notch. The houses constructed on these two technologies are easy for distinguishing even visually on notches in the cutting area. 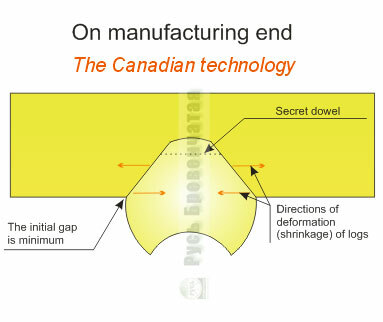 It is more difficult with an advanced Canadian notch into which the dowel in addition enters. He plays the major role in warming of corners of the house and maintenance of venting of walls, but about a thorn we will talk separately in the corresponding section. 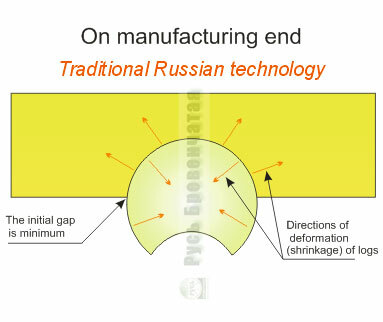 So, we will analyze processes of Russian and Canadian homebuilding technologies. For your convenience the schemes reflecting 3 stages of life of houses made with the Canadian and Russian bowls are resulted. We will consider them on-order. Stage 1. (Fig. 1 and 2). Log shell it is just made and is situated on a platform of the building company. Appearance of both variants is fine: gaps are minimum, appearance is pleasant. Stage 2. (Fig. 3 and 4). It have passed 2-3 years. 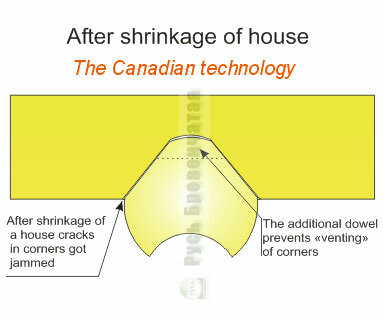 For this time in your wooden house there were serious changes connected with shrinkage of wooden designs. 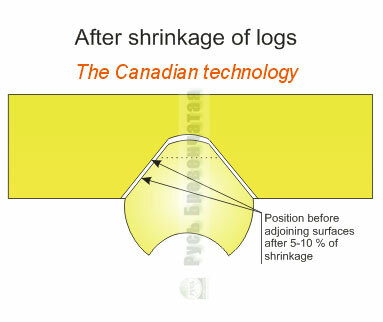 For the information: depending on initial humidity of wood, in the course of shrinkage there is a reduction of diameter of logs by 5-10 %. Forms of bowls, gaps in cups and grooves accordingly vary. Certainly, notches of both types are exposed to shrinkage (fig. 3 and 4), both in Russian and in the Canadian appear additional gaps, shells settle, filling the formed spaces. Stage 3. (Fig. 5 and 6). 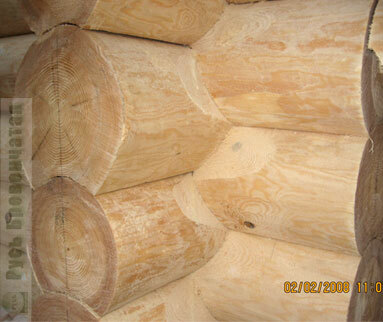 Certainly, logs cannot "hang" in air as it has been shown on fig. 3 and 4 (the stage 2 has been entered artificially for convenience of understanding by you of shrinkage process) and they will settle, occupying the released space. But here Russian and Canadian cups behave differently. If in Russian bowl there are big enough gaps (fig. 6) with which it is necessary to stop up with hermetics or other special materials, and in the Canadian bowl, at the expense of presence of notches and the triangular form of a bowl there will be a jamming of the formed gaps, will remain warm and, that is important, beautiful cutting. To understand, how the notch looks actually, we have resulted some photos. On fig. 7 the log with characteristic notches from both sides (the second notch from this foreshortening is not visible) is shown. 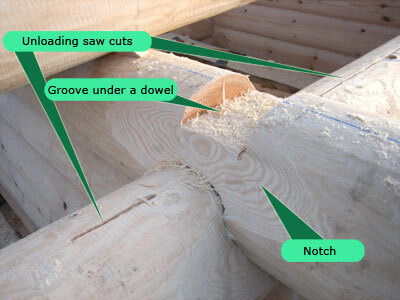 Pay attention to a groove in the top part of a log - it is intended for a dowel mentioned before. 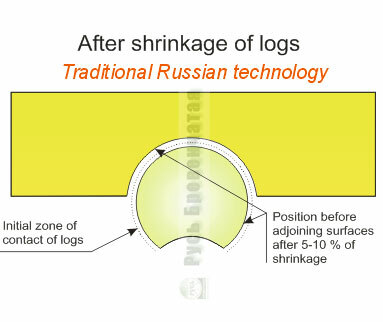 Besides, note two saw cuts in the top parts of the bottom log - this is also the important element of technologies applied by us, it will be info about them in section "Unloading saw cuts". In drawing 8 the view of the turned out wall with characteristic notches in corners is shown. On fig. 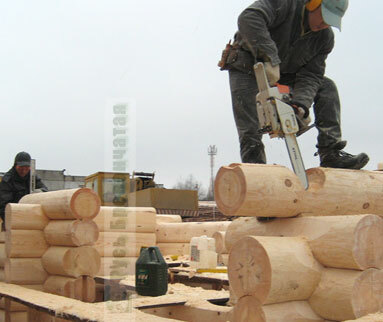 9 the master of the company "Log Russia" masterly cutting out the dowel in the Canadian bowl is represented. Pay attention to his tool. Having good skills and using the modern technics, it became possible to do very operatively difficult operations on adjustment of notches and dowels for the Canadian and Norwegian bowls. To make it with one axe would be inconvenient. 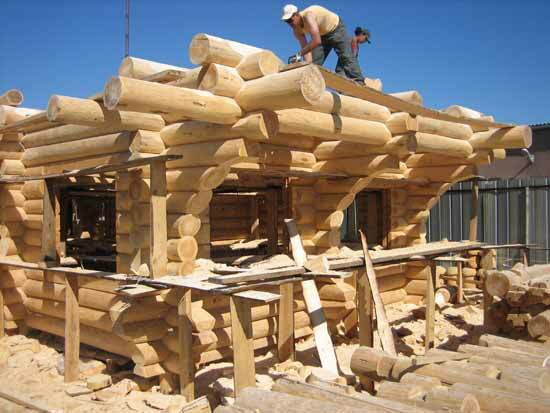 However, for the sake of justice, it is necessary to notice, that far not all companies in Russia which are engaged in building of wooden log houses in perfection have mastered these techniques. Therefore you always have a possibility to choose an optimum variant from the point of view of a parity quality/price.